At IFA 2105, Samsung announced a plethora of new tech gadgets for the home and body, including the SleepSense monitor and the Gear S2. Another announcement the Korean company made was the update to the SmartThings Hub, and the fact it will be launching in the UK next week. The revamp brings with it video monitoring and a supposed 10 hour battery backup in case of a power outage. Samsung also updated its SmartThings app with a redesigned interface, better customisation features, and room-by-room controls. Along with the updated hardware and software, Samsung is offering a Smart Home Monitoring service, which provides integrated access and control against intrusion, smoke and fire, leaks and floods, and more with real-time notifications and video clips. There is even an intelligent buffering feature that enables video clip recording that starts prior to the event so you can see what caused the incident. 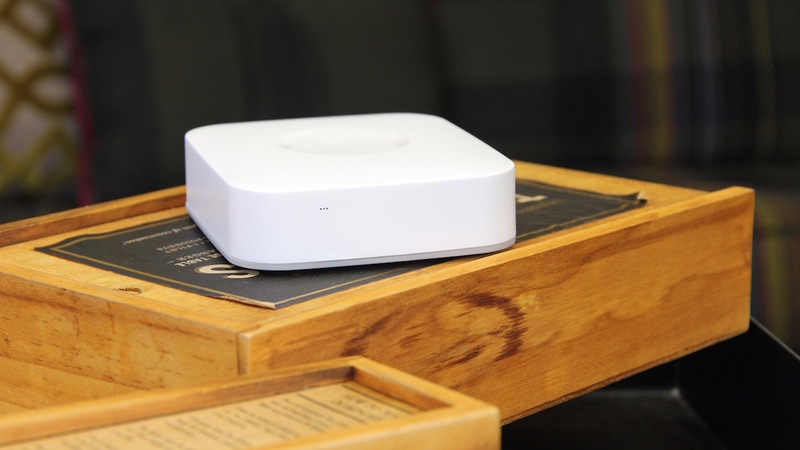 The SmartThings Hub is a small device that you connect to your router. The Hub communicates with various smart home products that you control all in one place using the compatible iOS, Android, and Windows phone SmartThings app. By connecting a number of smart home items, like movement sensors, thermostats, and smart locks, Samsung is hoping you turn your house into an all-singing all dancing Sammy smart home. The second generation Hub has a more powerful processor, which makes it possible to record video clips that let you see what has just happened when a sensor is triggered. It is also now able to trigger some sensors locally, without needing an Internet connection. There are number of different sensors that are compatible with the Hub. Detect motion, vibrations, and even when a door is opened with the Multipurpose Sensor and Motion Sensor. Ensure that your leaky faucet doesn't ruin your hardwood floor with the Water Leak Sensor. Get a notification when someone leaves or arrives home with the Arrival Sensor dongle. Monitor extreme temperatures with the Temp/Humidity Sensor. Trigger an alarm and bright light when unexpected motion is detected in your home with the FortrezzZ Siren Strobe Alarm. Have the Ghostbusters arrive when a poltergeist is detected with the SpookySense sensor. You can even turn just about any electronic device that connects to a power source into a smart device with the SmartThings Outlet. Although we may have made one of them up. The SmartThings Hub doesn't only work with Samsung sensors though. You can connect a D-Link Wi-Fi camera, Cree LED Bulb, Bose speaker, Schlage deadbolt, Honeywell thermostat, and much more. Samsung claims that the SmartThings open platform supports nearly 200 devices and is now on GitHub so developers can easily create even more compatible gadgets. With the SmartThings app, you can control your smart home devices remotely, like turning off lights or setting the thermostat before you get home. You can also set up the app to receive notifications when a sensor is triggered. For example, you could get an alert when your child gets home from school, or if the door is opened unexpectedly. Users set up rules to customise 'Routines', like turning on the lights first thing in the morning, or setting an alarm when you leave the house. Once a Routine is customised, just tap one button to trigger the actions. The newly updated SmartThings Hub is available in the US for $99 with sensors ranging in price from $30 to $55. It will launch in the UK next week – it's £99 for the Hub and £199 for the Starter Kit. SmartThings will also expand throughout Europe starting in 2016.